Add timeless beauty and interest to your environment with an elegant oasis that enhances your outdoor living space while bringing in the sounds of nature. 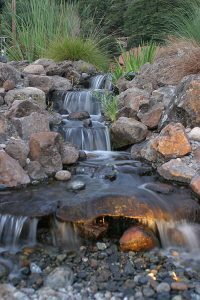 Cascading waterfalls, flowing streams, tranquil ponds and bubbling fountains naturally transform the landscape into an enticing sanctuary with life and motion that invites exploration. Yes they can be big and bold but we can also size them to better fit your lifestyle and space. 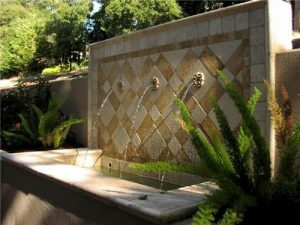 A fountain is a quick, easy way to add flowing water to your yard, and with a wide range of options, there’s one to fit any aesthetic. 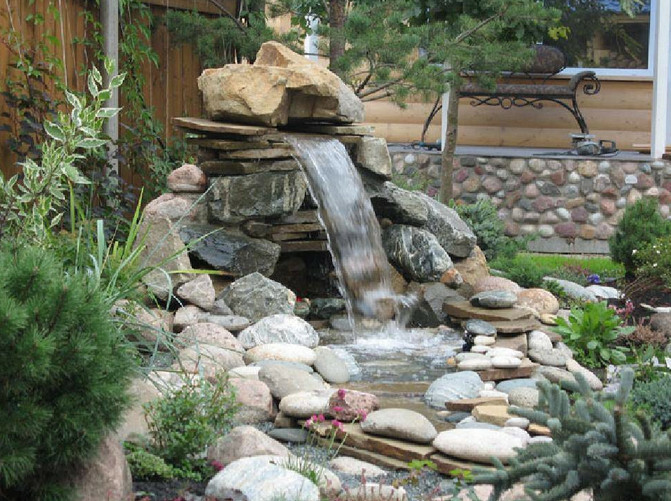 Our personal favorites are drilled rock fountains with vanishing water basins. Resembling a natural mountain spring, these fountains bring a certain sense of elegance and intrigue as water bubbles up from within a solid stone before splashing its way back to the ground. Once you’ve picked out your new fountain, we’ll drive it to your home, bury the basin in the ground and install the pump and fountain. All you need to do is add water and plug it in! In just a few short minutes, you’ll have the joyous sound of flowing, bubbling water filling your ears and soothing your mind. A stream or waterfall brings a true sense of flowing water to the Pike Peaks Region without having to live all the way up in the mountains. They’re great for stirring up a pond at the base and keeping the water moving to help prevent mosquito’s and other pests from taking up residence and breeding in your landscape. 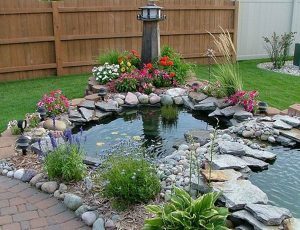 If you have a fish pond, it will also keep their water oxygenated and help prevent the buildup of algae and scum which prefer to grow in calm, still waters. Any time we install a waterfall, we’ll begin by excavating the path it will take, then we line the channel with a waterproof layer. This lining eliminates water loss through the ground, meaning you spend a lot less time and money refilling it and more time enjoying your one of a kind waterfall. The channel is then lined with stone and filled with water. A pump from the base to the top of the waterfall keeps water moving perpetually, giving you a constant source of running water. Ponds offer an interesting opportunity to expand your landscaping in a new direction. New varieties of plant and animal life will take root to compliment your land-based plants, bringing a new dimension to your landscape. Water lilies, cattails, fish, frogs, and more can all make your pond their home and bring in new colors and sounds, putting the finishing touch on a gorgeous landscape.